October 23, 2015 ~ Sara W.
One of the biggest reasons I started this blog was to keep things real. That being said, I’m really not feeling positive these days. I’ve actually been hitting up old journals with therapy notes and re-reading my own posts for some inspiration and pick-me-up. Maybe the change that comes from a move is affecting me? Perhaps it’s the sadness of knowing that another one of my littles is off at school a couple of times a week? Or possibly I am entering the lovely world of lows that come with Bipolar II? Who really knows? Regardless, it seems foolish for me to write something upbeat, when I’m hardly feeling that way. I’m not going to get all Debbie Downer on you, but no real words of encouragement this week. Nope. Today is a simple reminder about the importance of reading to your kids! At the end of the day in our home, my three oldest kiddos get to have down time while I put my baby to sleep. Customarily, this equates to TV time where they argue over whose pick it is to choose the show. Last night, my second-grader said she didn’t want to watch TV and that she wanted to snuggle with me instead. What mom can say no to that?! Then she asked if I would read books with and to her? Even better! She is so good about reading on her own and already reads so much for her school reading log that I forget to take a moment and read to her anymore, it seems. So, we snuggled up and read books together taking turns reading out loud. My other two littles had just reached the end of their show and bedtime was nearing. However, my daughter and I were still in the middle of a book, Mr. Pine’s Purple House , and I was just as excited to finish reading it as she was. Soon my toddler and nine-year-old huddled around my daughter and I. I continued reading on, not before noting the beauty of the moment I was in. Here I was a mother of four, with one baby peacefully sleeping, and three beautiful children sitting around me all listening as I read about Mr. Pine’s desire to simply have his home stand out among the other fifty white homes on his street. Those are the moments I cherish. Those are the moments that make me realize that perhaps my life isn’t really all that boring, but merely simple. Earlier in the day I had already done a bit of reading with my toddler so that we could fill up his reading chart, and my girls had all met their reading quotas and then some. There has been an increase of reading in our home since school started back up, and I’m loving it! The greatest part is that my baby, well 15-month-old, has a love for books already also. One of his first words was “book,” and I couldn’t be happier! 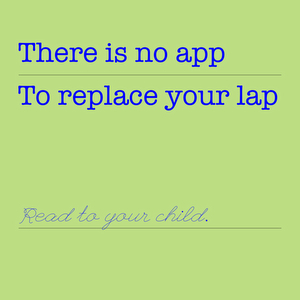 I’m reminded of the picture I saw on Facebook posted by Southport Branch Library that read, “There is no app to replace your lap. Read to your child.” Reading to my nine-year-old, as I did last night, has become more rare as she develops as a reader. But, I truly believe that all of those many years that she sat on my lap as I read to her have helped her love for reading blossom. And now, four kids later, I’m realizing that no matter how busy life can get, the time spent reading to my children lifts each of us up in so many ways. There really is no app to replace my lap, and how grateful I am for that! When my oldest 2 were about 9 and 11, I was working with them on doing the dishes. Of course no one likes to do it, but it’s a necessary evil. One day, while they were working, I happened to be reading the paper, and read a short article that I thought they’d enjoy out loud to them. THEY LOVED IT. And, since I’m a stickler for current events, it was the perfect time and way to do three things: dishes, current events, and reading!! I really love that idea, Laura! Thanks so much for sharing! I think I’m going to implement that in the near future. They would love that!